Himachal at a Glance: "Snow-laden Region"
Himachal Pradesh is (known as Devabhoomi, the abode of the Gods) a state in Northern India. Its area is 21,495 sq mt. (55,670 km2) and is bordered by Jammu and Kashmir on the north, Punjab on the west, Haryana on the south-west, Uttarakhand on the south-east and by the Tibet Autonomous Region on the east. Himachal Pradesh is famous for its abundant natural beauty. it was founded in January 25, 1971, with capital at Shimla covers the Area 55,673 km⊃2; for population of 68.65 Lakh. Himachal Pradesh is (known as "Devabhoomi", the abode of the Gods) a state in Northern India. Its area is 21,495 sq mt. (55,670 km2) and is bordered by Jammu and Kashmir on the north, Punjab on the west, Haryana on the south-west, Uttarakhand on the south-east and by the Tibet Autonomous Region on the east. Himachal Pradesh is famous for its abundant natural beauty. 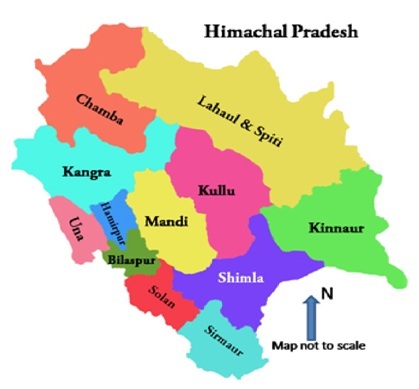 it was founded in January 25, 1971, with capital at Shimla covers the Area 55,673 km⊃2; for population of 68.65 Lakh. Over 93% of the population in Himachal depends directly upon agriculture which provides direct employment to 71% of its people. Kinnauri Nati,Namgen, The Gugga Dance,The Jhamakada Dance,The Chhanak Chham Dance,The Ghurehi,The Dandras,The Thoda dance,The Kullu Natti.